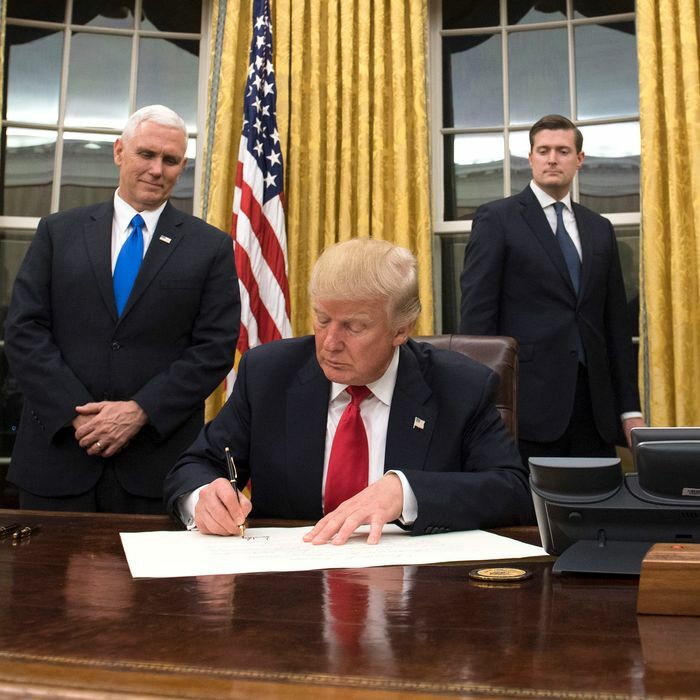 Shortly after his inaugural parade on Friday, President Donald Trump signed his first executive order, directing federal agencies to “ease the burden of Obamacare.” The order is vague, and has no immediate effect on the health-care system. But it paves the way for the weakening of the Affordable Care Act, and signals that Trump will fulfill his campaign promise to make dismantling the health law one of his administration’s top priorities. The Trump administration declined to explain what that means, and as the Washington Post notes, “In general, federal rules cannot be undone with a penstroke but require a new rule-making process to replace or delete them.” But the order means that federal agencies could try to ease enforcement or penalties pertaining to certain aspects of the law, such as the individual and employer mandates, or requirements that insurers include certain benefits in health plans. Medicaid is not mentioned specifically, but providing the states “greater flexibility” could mean that rules will be loosened for states that expanded the program to cover low-income Americans. Reminder: an EO cannot violate the law. It has to work within the law and the Constitution. Often, that's a lot of wiggle room, though. Trump signed the order while seated at the Resolute Desk, flanked by Vice-President Mike Pence and senior aides Steve Bannon, Jared Kushner, and Reince Priebus. Trump also signed the commissions for Defense Secretary James Mattis and Homeland Security Secretary John Kelly, who were confirmed by the Senate on Friday. Mattis and Kelly were then sworn in by Pence during a separate ceremony. Priebus, Trump’s chief of staff, also issued an executive memorandum freezing pending regulations to give the new administration an opportunity to review them. Obama enacted a similar freeze after he was sworn in in 2009. The memo could prevent new Energy Department efficiency standards from going into effect.
.@POTUS suspended a planned cut in FHA mortgage insurance premiums, which @nardotrealtor says will cost 40k families a shot at a new home. That’s 40,000 families who just lost their chance to buy a home thanks to brand-new @POTUS @realDonaldTrump. We must measure @POTUS @realDonaldTrump by actions, not only words. And today he made it harder for families to achieve the American Dream. The Oval Office also saw some cosmetic changes on Friday. There was a brief replay of the controversy from 2009, when President Obama moved a bust of Winston Churchill from the Oval Office to the White House residence to make room for a bust of Martin Luther King, Jr. Reporters spotted the Churchill bust back in the Oval Office on Friday, and initially thought that MLK bust had been removed. Later journalists confirmed that both the Churchill and MLK busts are in Trump’s Oval Office.